"An excellent side dish. Tastes like pizza without the crust!" Preheat oven to 400 degrees F (200 degrees C). Coat a shallow baking dish with cooking spray. 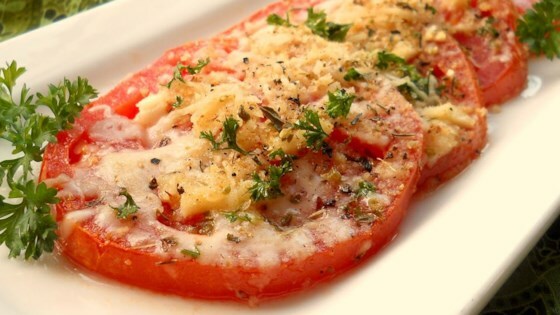 Place tomato slices close together in prepared baking dish. Sprinkle with cheese, bread crumbs, garlic, parsley, salt, pepper, and oregano. Drizzle with olive oil. Bake for 20 minutes in the preheated oven, or until cheese is lightly toasted. I think the cooking time on these needs to be adjusted. We cooked them as stated and they were mushy and too soft. If I make these again I will reduce the oven temp and cooking time.